Nigeria could be said to have entered the tech startup scene fairly late, definitely behind the likes of South Africa, Kenya and Egypt. Yet this changed when the mobile phone revolution happened in the first decade of the new millennium and it became clear that digital services are a supplier of many direct and indirect jobs that also solve pressing needs. What Nigeria might have lost in coming late, it has definitely gained in the pace with which the local startup ecosystem has grown over the past five years. Local incubators such as CcHub, Passion Incubator, She Leads Africa, Tony Elumelu Foundation and Ventures Platform operate side-by-side with international initiatives such as MEST, Village Capital, Impact Hub, Seedstars, YCombinator and 500 Startups. Together they support the growing network of entrepreneurs implementing technology-enabled solutions that solve some of the grand developmental issues that Nigeria and many other similar emerging economies face. This is combined with a emerging generation of resilient entrepreneurs who are able to overcome challenges and persevere. The ‘first generation’ of tech companies such as IROKOtv, Jobberman and Paga have become ‘real’ companies – reducing the hype around tech in Nigeria by creating increasing evidence that sustainable profitable companies can be built around a technology proposition. Significant funding rounds of Andela (USD $40M), Flutterwave (USD $10M), Terragon Group (USD $5M), Cars45 (USD $5M), Rensource (USD $3.5M) Paystack (USD $1.3M) and others have gotten a lot of international exposure. Larger capital raising rounds by a growing number of tech companies signal a ‘coming of age’ of the ecosystem. Specifically, there is increasing confidence and early evidence of the fact that capital providers believe that these companies and their founders are capable of delivering decent returns. This in part due to the increasing ability of companies to raise more capital (though still small) and the number of Africa-focused venture funds that have closed in the last twelve months. The serious business-building capital available to tech companies increases the probability that companies will receive capital, increasingly from combinations of both local and international sources, when they need it to scale and to grow. On the other side, the acquisition of Konga by Zinox is widely believed to have been a significant down round. Unicorns, down rounds and outright company failures are an inherent part of the world of venture capital. Tech entrepreneurs are learning that it is ‘OK’ to fail as long as one learns from the failure. This is part and parcel of the entrepreneur building process. The startup ecosystem is not without its challenges though. Inadequate infrastructure especially outside the main cities, lack of broadband internet (although telcos have been reducing their prices for unlimited data as part of a race to the bottom) and reliable power supply, have had a constraining effect on the growth of tech companies and the dearth of software development skills. This has resulted in many startups outsourcing software development to other parts of the world (India, Portugal, Estonia, others) which is not a good use of the capital that they are able to raise, but it also militates the development of a robust pipeline of key talent that the ecosystem so badly needs. Initiatives such as Andela, focused on training software developers, will most likely have a long-term effect when their trainees have completed the program and when they form their own businesses. With the increasing number of tech entrepreneurs there are a growing number of seed funds providing capital to startups (e.g. Growth Capital Fund, Lagos Angel Network, MicroTraction) – in the region of USD $25K to USD $100K. For a number of years now, Nigeria has attracted about a third of all startup funds available in the continent. Coupled with this is the Lagos Angel Network (LAN) which has grown more active in the recent past, providing seed and pre-seed capital to entrepreneurs through their regular ‘Deal Days’. The result of these types of activities is an increasing and more robust pipeline of investible companies for providers of capital. The hopes are that in the longer term this will persuade more international investors to get interested in Nigeria, who may be reluctant to invest in the country with its bad reputation, which takes time to change. Before joining TLcom, Omobola Johnson was Minister of Communication Technology in Nigeria from 2011 to 2015, focusing on the launch and execution of the National Broadband Plan, and the support of the Nigerian technology industry, including the pioneering involvement of the government in a local VC fund and a network of startup incubators. Prior to serving in the Nigerian government, she gained over 25 years of consulting experience with Accenture. 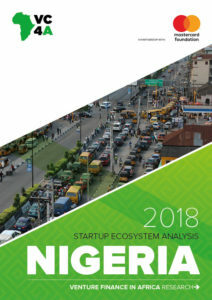 VC4A research on 3,360 ventures registered in the country shows a clear relationship between venture performance and the support these ventures receive from the Nigerian startup ecosystem. For example, companies participating in ecosystem support programs are 23% more successful in securing investment, and are more likely to be generating new jobs. More specifically, 76% of the Nigerian ventures are creating jobs with an average of 8.5 FTE per venture (Graph 2). When taking a further look at the jobs created per age group, 56% of the employees hired are between 12 and 35 years. This is a considerable contribution to the country given its growing population and justifies further investment in the growth and development of the startup ecosystem and the entrepreneurs it supports. Another indicator of progress is the growth in average investments secured by Nigerian ventures compared to last year’s study. This year an average amount of USD $93,651 is recorded which is 22% higher than the amount registered last year. This indicates that despite ecosystem challenges, the quality of the ventures from Nigeria continue to improve over time and results in higher valuations and larger fundraising rounds. Doubling down on this momentum, it is possible to secure a series of success stories that exemplify what is possible in the country’s fast-growing markets. VC4A research 2018 is made possible with support from the Mastercard Foundation and the Work in Progress Alliance. In addition to a pan-African view, the 2018 research deepens its annual analysis by adding six country deep dives in the following countries: Ghana, Kenya, Morocco, Nigeria, Senegal, and South Africa. These reports have been developed in collaboration with Dalberg Global Development Advisors and local experts in each country. The research explains in more detail what each startup ecosystem looks like and identifies opportunities for their continued development. These mapping studies help us learn how startup ecosystems are developing across the continent. They include research and analysis on a variety of startup hubs, including Accra, Casablanca, Cape Town, Dakar, Johannesburg, Lagos, and Nairobi. Please contact the VC4A research team – thomas[at]vc4a[dot]com – if you are interested to discuss adding other African cities to this list. If you would like to download the report and receive full access to the Venture Finance in Africa research database with more country-specific reports and editions from previous years, register your VC4A Research Account now.